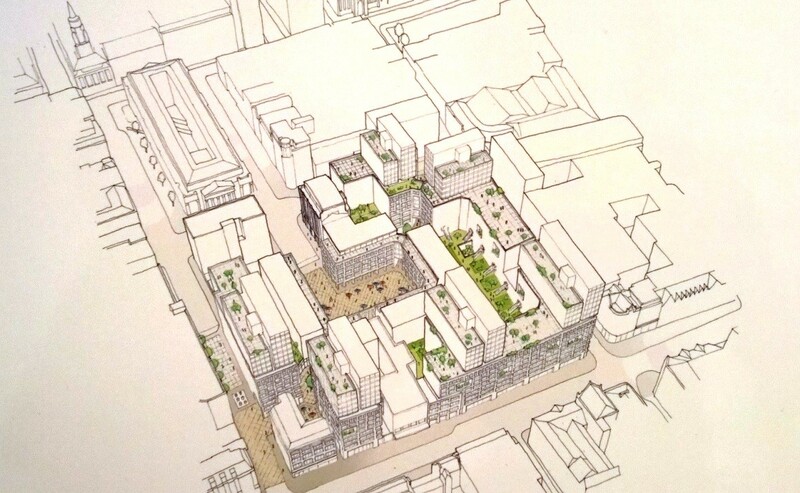 A pre-application consultation has opened into plans to create 500 homes, a 120 bed hotel, 500 student rooms and retail on land bounded by Hutcheson Street, Trongate, Candleriggs and Wilson Street in Glasgow’s Merchant City. This has seen Candleriggs Ltd, a 50/50 joint venture between Mace and Mercer Real Estate, appoint Richard Murphy Architects to repair a missing chunk of the city. Candleriggs Quarter centres on a central square measuring 50 by 35m, equivalent to half an international size football pitch, which will be lined on all four sides by cafes and bars, boutique retail and a hotel. Each corner of the square will give access to either a destination or a major route. In a statement Candleriggs Ltd wrote: “The Merchant City has a tradition of terminated vistas and the new square will create a fitting termination to Brunswick Street within our site. The square will also sit on a new diagonal axis which links the Merchant Square through a sequence of public spaces to the Trongate and Argyle Street beyond. The position of a new anchor store on the corner of Trongate and Candleriggs will help draw activity along Trongate and down Candleriggs – knitting the site into the city. 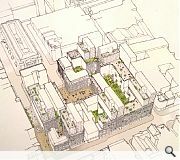 On-site parking will be limited to the provision of a small underground car park off Brunswick Street for use by private residents with public realm enhancements and private communal courtyard gardens also provided. 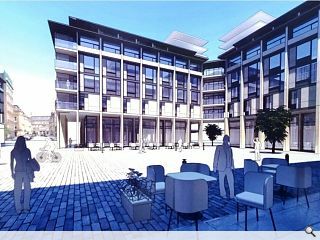 A formal planning application will be submitted to council officials in December. Some of this sounds very promising - particularly the connections between neighbouring streets and rooftop terraces a la Buchanan Quarter. However, I do worry about the quality of what appear to be glass boxes perched on top of various buildings in the sketch. These could very easily be insensitive to the sandstone surroundings and detract from the quality of the finished aesthetic. The massing along Argyle St, Candleriggs and Wilson St looks atrocious. The usual over-development led by a greedy developer. However, I'm a bit disappointed as well that Murphy hasn't seemed to in any way try to reference Glasgow in the scheme. 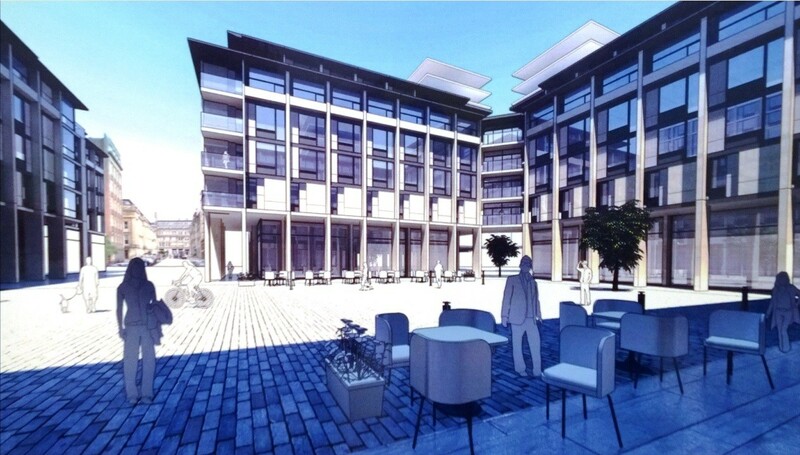 That rendering could be any new-build flat scheme (or science/office park) in any city, anywhere. Am in favour of the development and the efforts to provide for good public realm and encouraged that parking is being limited, but the scheme isn't anywhere near good enough yet. Please try harder. Worrying elevations. Characterless Murphy Edinburghistic wallpaper. Fingers crossed he is only responsible for masterplanning and not building design. The layout, density and mix of uses looks extremely exciting. I like the elevations (it's the city centre, guys) & I'm glad the plans appear to be for something unapologetically modern. I do echo the misgivings re: Murphy, though. I too agree that the massing and density looks appropriate, however I don't agree that the elevations are unapologetically modern, instead, to me they appear dated and fairly drab. And I know it's the city centre, but my point was that it is the heart of Glasgow's Historic Merchant City, and you will not find any buildings which echo this particular style remotely close to this area, and that it is clearly an Edinburgh City Centre style. This to me shows absolutely no attempt to be contextual in any way other than massing. It wouldn't look out of place along clyde.Remeber would you like to see this on one side of the Royal mile,No me neither,This is in the most Historic part of the city and anything built on the Argyle st near trongate should fit in with surrounding buildings.I love modern as well ,But I really hope the Argyle st trongate part isn't modern glass etc etc or horrid cladding. It can still be modern and be contextual, as it is a fairly large part of the fabric of the Merchant City which has strong links to many key street frontages. well I've lived in the original top of the S.E corner of candleriggs and wilson st for 23 years and at that towering corner seems particulary insensitive an elevation to me, it used to be 2 stories high. i understand that living in the G1 area comes with a certain amount of noise and lack of view but this takes the biscuit, as they say. why would you have those 'gardens' at north east as opposed to the south east or west anyway? The plan seems very appealing, a new urban open space is a tantalising prospect. However I echo the misgivings about the overdevelopment of the street elevations. Tall glass buildings in the surrounding context just don't fit. Also, it would be nice to have some reference to the old area, i.e. reference names of the courts and sidestreets in the vicinity, such as Old Post Office Court, Melville Place, Smiths Court, Candleriggs Court etc as well as the recent news of John MacDonald, a historic figure in the emergence of Canada as a nation, being born in Brunswick Street/Place.